The girls and Montgomery haven't been venturing very far from the coop the past week. Actually they haven't even left the run. 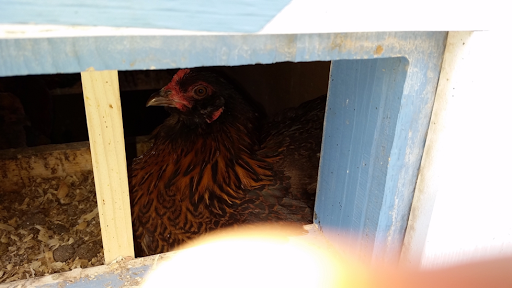 Maisie was most put out that I would even think of disturbing her warm nest to check for eggs. But as it turned out, she was hiding one. Instead of venturing out tonight, I will stay home and knit tonight. The wind is whipping the snow over the flat roads we have around here. Many areas of slick, or drifts roads, intersperses with dry roads. I think I will stay home. The Sockhead Hat has been cast on. I am attempting to do it Magic Loop method rather than with double points, but my needle is only 32 inches instead of 40, like I would prefer but progress is being made. 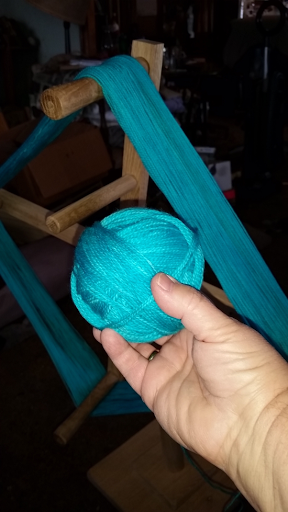 Many inches remain to knit. On tiny size 2.5 needles. Many inches of ribbing. Many inches if stockinette. Many, many inches. Plain, brainless, boring knitting. I may start my granddaughter's sweater soon, just for the variety.